Swipe Through is a set of Adobe Flash components which allow you to control the playback of your animations with touch interactions. You create prototypes for this purpose. But the process of prototyping itself can be the quickest way to foresee flaws and spark ideas for alternative solutions. Even if the tool you use doesn't need you to write code. It can still require to define very complex logics, and this takes time. Too much investment in building a prototype creates too much attachment and can discourage the exploration of better solutions. 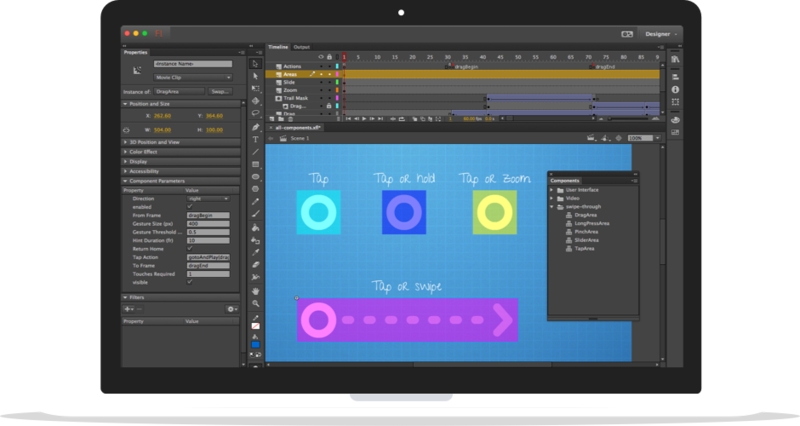 Define complex behaviors using the best animation tool ever made (Adobe Flash). Add interactivity just adding draggable components to the timeline, no code required. You should always keep your prototypes simple. But if you really have to, with the power and versatility of ActionScript you can enable any type of logic. You can run your Flash movies virtually everywhere, from mobile devices (using Adobe AIR) to desktop browsers.